Produktinformationen "World Heritage in Korea - 2nd Edition"
Korean cultural properties as a mirror of time attract many world citizens. Korean cultural heritage sites have calmly withstood the abrasion of time and function as a mirror of the Korean past, present and future. Over time, the line, color, and shape of the Korean landscape has surpassed the regional limits of the Korean peninsula. World Cultural Heritage is a cultural property title designated by UNESCO. The committee of each country submits an application for registration of World Heritage status of historical properties. The executive committee of UNESCO then deliberates and makes the final decision. A World Cultural Heritage designation can upgrade a country's cultural status. There are numerous World Heritage properties in Korea. They include Changdeokgung Palace, Hwaseong Fortress in Suwon, Seokguram Grotto, Bulguksa Temple, Dolmen Sites, and Gyeongju Historic Area. World Heritage in Korea contains the beauty of heritage sites that could be found nowhere but in Korea through the marvelous works of photographer Suh Jae-sik. Suh Jae-Sik is a well known photographer who has published widely and who has won a number of prestigious awards both nationally and internationally. In 1986, he was a photographer for the Asian Games, and again in 1988 for the Olympic Games. For his remarkable photography, he received the "Prize from the Ministry of Culture oand Tourism" at the photography competition held under the auspices of the Korea National Tourism Organization. In addition, he has received more than 50 prizes at various photography competitions. He published The Beauty of Korea in 1998 and The Beauty of Seoul in 2001 . In 1999, he was commissioned to work on the book Hanoak: Traditional Korean Homes. For his outstanding work he received the "Hankuk Baeksang Publishing Culture Grand Prix" that was conferred by the Hankuk Ilbo Daily Newspaper. Mr. Suh, a member of the Korean Photographer's Association, is an outstanding photographer who has greatly influenced the field of photography in Korea. 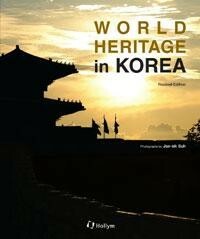 Weiterführende Links zu "World Heritage in Korea - 2nd Edition"
Unser Kommentar zu "World Heritage in Korea - 2nd Edition"
Kundenbewertungen für "World Heritage in Korea - 2nd Edition"